What Do Wild Rabbits Eat and Drink? What is Gulped by Rabbits? What Do Wild Rabbits Eat in the Winter? 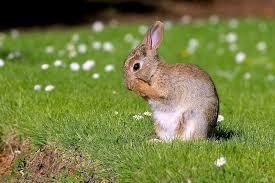 Rabbit is a herbivorous animal that lives on grass, fruits, vegetables, and other lush green fillers. 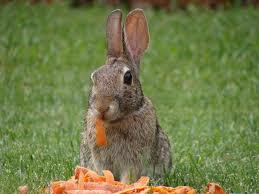 Be it a wild rabbit or a rabbit that is kept as a pet, it feeds only on veggies and fruits. These animals are playful and loyal. Unlike dogs, they need minimal or no supervision. 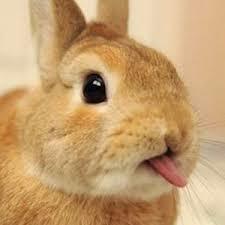 Despite its herbivorous nature, if you feed rabbits with meat, then its digestive system gets deteriorated. Rabbit feeds on hay. This is the popular diet that is followed by 80% to 90% of rabbits. It is the only food that supplies the essential fiber and keeps their digestive system healthy. With lack of fiber, it leads to blockages and also health issues, especially gastrointestinal stasis. When this happens, the lifetime of rabbits falls. The teeth of the rabbit would grow over time. When you leave the rabbits to graze hay, it wears down its sharp teeth and thus lets it to stay safe without hurting itself. In addition to hay, rabbits love to eat weeds, vegetables, fruits, flowers, and grasses. These all foods would complete the diet of a rabbit. With the shortage of these food items during the winter season, they live on barks, twigs, grass, etc. In the spring season, they live on buds and wait for the vegetables to grow and flowers to blossom. What Do Wild Baby Rabbits Eat? The diet of pet and wild rabbits is the same. If you are shopping for wild or pet rabbit food, you should first buy hay and also feed the rabbits with vegetables. In addition to buying hay, you shall also buy pellets and treats, which rabbits love to munch. You need to give the same care and feed the same food to both wild and domestic rabbits. You should never separate baby rabbits from their mothers since their mother would nurse them in the first few weeks of their birth. It is quite complicated and challenging to feed and take good care of the baby rabbit when they are badly injured or orphaned by their mother. You need to substitute the nutrients that are supplied to the baby rabbit through their mother’s milk. It is recommended to seek the help of the local rehab center or get the advice of vet to feed the baby rabbit. Most probably, vets would advise buying goat milk to feed the rabbits. Rather supplying low-fat food, you need to mix probiotics to keep the bunny rabbits healthy. The feed you give to the baby rabbits would depend on their age. For instance, if the rabbit is 1 to 2 weeks old, then you need to give 5 to 7 cc/ml twice every day. More importantly, you need to make sure that the bunny rabbits are defecating and urinating regularly. Hay: What do wild bunny rabbits eat? This is the common food item that is gormandized by every rabbit. Alfalfa is the best choice for adult rabbits, and also you can feed them with grass, hay and green leaves. If you are feeding hay to rabbits, ensure that it is fresh. The rabbits cannot stay healthy, without eating hay. The other herbs, flowers, and weeds that are hogged by rabbits include Comfrey, Lavender, Plantain, Yarrow, Borage, Coltsfoot, Goosegrass, and Nettle. Vegetables: You can feed the rabbit with different varieties of veggies. Few of the veggies that are loved by rabbits include choy, broccoli leaves, mint, and watercress. Pellets: This is rich in fiber, fresh and is power-packed with very low proteins. Ensure that this food is not loaded with any kind of additives that would disturb the digestive system of rabbits. This should be added in small quantity to the rabbit’s diet. Treats: The treats that you find in the market have a huge amount of sugar and fat. 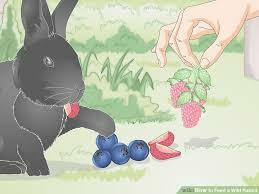 Rather than feeding the rabbits with non-healthy treats, switch to strawberries, apples, bananas, raspberries, etc. You should supply this food in small quantity, since feeding them with this food in massive quantity would increase their sugar level. In addition to these, the other foods that you can feed rabbits include celery leaves, squash, radish, pumpkin, green beans, chicory, cauliflower, kohl rabi, peppers, etc. Furthermore, fruits that can be served to rabbits include mangoes, melons, plums, kiwis, blueberries, apricots, tomatoes, pears, pineapples, papayas, peaches, etc. Rabbits will drink enough water after filling its tummy with hay. It is important to keep the rabbits hydrated to avoid them from getting prone to health issues. Many rabbits depend on groundwater to quench their thirst. You need to serve bunnies with a bowl of water, so whenever they feel thirsty, they drink the water and keep themselves hydrated. There are special water bottles available for rabbits in the market. These are widely used by the breeding facilities as they cannot make each rabbit drink personally. Similar to domestic rabbit, wild rabbits will also get their protein food by eating grass stems that are found in warrens. No matter where the wild rabbits dwell, they like to munch grass around them. To stay healthy and supply enough nutrients to the body, wild rabbits should eat grass every day. These rabbits get the required energy and calories by eating huge volumes of grass. However, the rabbits that are kept as pets by the people cannot eat as much grass as wild animals, since they are supplied with dry foods, hay, vegetables and other rabbit friendly food items that are rich in proteins, vitamins, and minerals. These food items do not let them chew much. Cottontail Rabbit: These rabbits are widely found in the North American region and are identified with their cotton ball-like tail. As these rabbits are herbivorous, therefore they survive on plants. They love to go play in the fields and meadows where there is lots of fresh grass. These rabbits make their home in the populated areas while few are domesticated and are kept as pets by the people. Baby Cottontail rabbit: Baby rabbits are taken care of and fed with mother’s milk. The mother rabbit which goes in search of food would return to their abode to nurse their little babies for around five minutes, which is enough for the rabbits to fill their tummies. What do wild cottontail rabbits eat? After five weeks of their birth, rabbits would gain the ability to eat veggies, hay, and fruits. Diet of Cottontail rabbit during summer: There is no doubt in it that rabbits eat only plant food. No matter whatsoever may be the season, they eat plants and seasonal vegetable and fruits. In the summer season, they love to eat clover, herbs, fruits, grasses, and other leafy items found in the garden. Rabbits are supplied with enough energy by eating grass. Diet of cottontail rabbit during winter: The diet of rabbits during biting cold season is different. They feed on twigs, barks, and woody plants. They love to eat various wood parts found in plants like oak, sumac, dogwood, and birch. Cottontail rabbits that are domesticated: These rabbits are purchased from the pet stores or shelters. The domesticated rabbits are fed with pellets, treats, vegetables, and fruits. Due to their young age, small rabbits are not fed with pellets. The different colored vegetables are served to these young and tender rabbits. Cottontail rabbits that are abandoned: If you find small and bunny rabbits that are abandoned, then you would need to give the best care and treat them like their mother until their mother returns to the burrow. You can seek the help of animal rehabilitator to feed these rabbits and keep them energetic. If you are taking the rabbit hole, then you need to feed milk for a few days. However, you need to seek the help of vets to get the list of food items that you can serve the young rabbits. 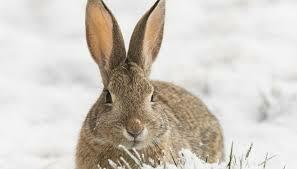 Rabbits feel cold during chilly weather conditions. To keep them cozy and warm, you need to serve Timothy to the pet rabbit beside keeping a litter box closer to them so that they would not step out in the bone-biting cold to litter. Wild Rabbits: These rabbits actively search for the food by going beyond what they regularly eat in winter. If you do not supply them with the fresh grass or hay, then they survive on two food sources. They feed on low nutrient wood parts of the plant like twigs, buds, the bark of the tree. The second food item on which rabbits feed is cecotropes. This keeps their digestive system healthy and supplies enough energy that is required for them to play and stay active. To feed the rabbit, you need to put twigs, branches, and young trees on the ground. You need to give strict instructions to your children not to feed rabbits, since this may intimidate them and would make them run away. Pet rabbits: The rabbits that are kept at home as pets would not hibernate in winter. However, the fur of these rabbits would grow thicker during the winter season to keep them cozy. If you find the rabbits to be less active during this season, then you need to take them to the vet immediately. Though these little animals have thick fur, still you need to keep their shelter warm and cozy. Providing right shelter to rabbits will keep them safe from other prey animals. Though the food that you supply to rabbit remains the same in all seasons, the quantity differs from season to season. Rabbits love to eat more Timothy to gain fat, which actually helps them stay warm. You need to make sure to supply enough quantity Timothy to your pet rabbits in this season. Moreover, the drinking water should not be too cold. So, make sure to give lukewarm water. In addition to Timothy, you also need to feed them with vegetable and fruits, since these food items are the ones that supply them with the required sugars and carbohydrates. If you see a rabbit in your meadow or field, quickly go into the kitchen to get something and feed the rabbit. However, prior to getting a handful of carrots or fruits, you should know how to feed a rabbit to keep their health intact. Here is how to feed a Wild Rabbit. If you want to keep the rabbits as pets, you can make a shelter for wild rabbits to stay or otherwise you can keep food in the yard to let the rabbits come and hog. As wild rabbits love to wander in shrubby areas, you can create a particular dining area in your garden for wild rabbits to go and eat. In the summer season, wild rabbits love to eat grass and weeds; therefore, you need to leave the grass and leaves in the law untrimmed. This not just supplies food for rabbits, but also provide them with the shelter. Rabbits love to eat twigs and barks in winter, so you can gather twigs at one place in your yard to make it easy for rabbits to hog. Make sure that placing of food items that are loved by rabbits in these areas also attracts other wild animals, so keep a close watch on that area to avoid other prey animals to enter your property premises. This article has all the necessary information about the food habits of both wild and pet rabbits. “Wild” is a word that makes a person feel that the animal would be a carnivorous and this is not true in many cases just like the case of a wild rabbit. So, feed rabbits with the above-mentioned foods and take good care of this one of the most beautiful and cute animals of the world.